The country of Italy is well known for its many towns, each of which has some special characteristics that are often overplayed by the office of local tourism promotion. On Elba Island however I always have the impression that the exact opposite happens, especially with regard to mineralogy. Those who have visited the most important mineralogical museums of the world, and I mean in all continents, from Australia to the United States, from northern Europe to beyond the Urals, will have had the opportunity to come across the beautiful crystals from our own Elba. For those who didn’t know, the island is home to two specific geological and mineralogical areas and several with the highest scientific and aesthetic value: in the east mineralization in iron, in the west the crystals of Mount Capanne. Although the scientific community and collectors around the world know by now that Elba is one of the most interesting mineralogical areas, attempts to create a mineralogical museum worthy of the name have always been difficult, fragmentary and ephemeral. A large part of the responsibility we Elbans must bear ourselves, the island has been traditionally divided and entrenched as only can happen in Tuscany, even during the 2014 referendum held to unify the eight town councils, some 29,000 local residents decided to vote to stay independent. 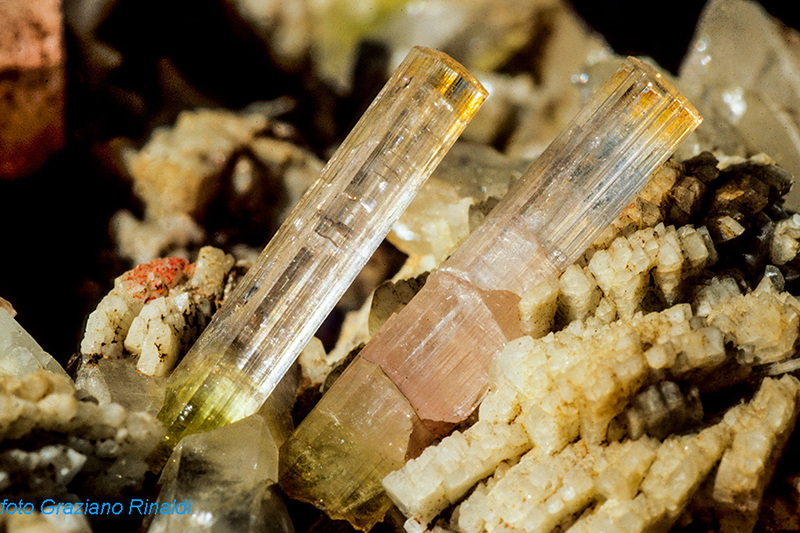 In recent years, however, some commendable initiatives have begun, due to a united love for our minerals, one in the east (Iron Mining Park with Mineralogical Museum) and one in the west (MUM, the Mineral Museum which we are talking about in this post): set directly in the same places where rare and valuable crystal structures have been found in order to allow visitors to appreciate these treasures of Nature. The MUM, Mineralogical Museum Luigi Celleri is the most recent. It is located in the small village of San Piero, 230 meters above the sea, a few minutes’ drive from Marina di Campo, where lies the largest beach on the island. The Municipal property is managed by the Cooperative Pelagos headed by Joseph, an enthusiastic forty year old who along with the other members is trying to reconcile entrepreneurship and love for his land. The cooperative, apart from running the museum, organises guided tours, on foot or on some donkeys, as the areas where the minerals are usually found in the most important deposits, are around a couple of km from the museum. Also interesting is the guided tour of the still active granite quarries. The museum although not huge, has great quality and is right in front of the Romanesque church of St. Nicholas, another gem, this time architectural. The exhibits are worth viewing. 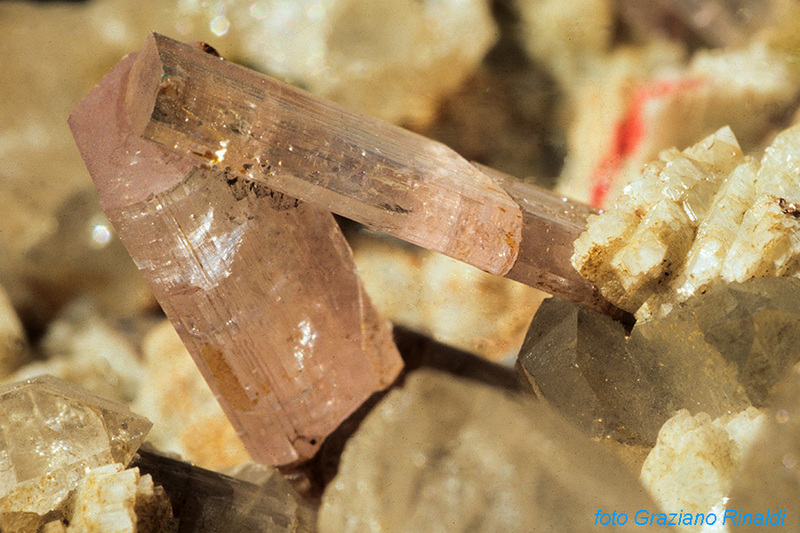 Among all the minerals elbaite excels and the elegant tourmaline, discovered for the first time on Elba in 1825, like other local crystals, has the distinction of containing lithium. 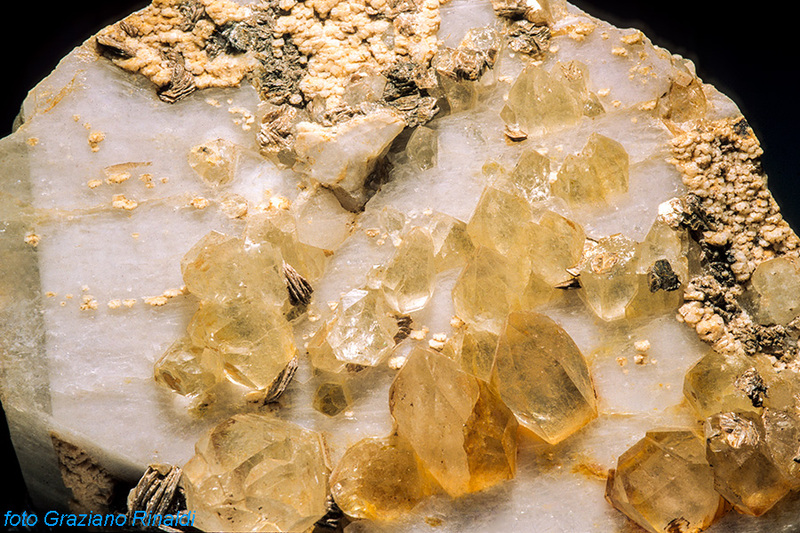 The crystals of Elbaite are usually polychrome, in particular bottle green, yellow, pink, to black. The most complete collection is in the Museum of Mineralogy, University of Florence, a large part of it sold by the scholar and eclectic Elban collector Raphael Foresi. In the deposits, along with tourmaline, are an unusual amount of other rare crystals, among them the long and perfect colourless beryl, sometimes with a scattering of black needles of other minerals, or a deep emerald green variety in aquamarine, or even a pink crystalline, which is called morganite. Long list of crystals were found the first time in these white granite veins of Elba and some are very difficult to perceive with the naked eye. But the most astonishing thing is to see such a variety of minerals of different colours and shapes all together, like living organisms that were born one inside the other and overlapping, admirably harmonic and perfect. The tireless Joseph and his team still have some work to do, but they have already prepared a laboratory where it is possible to closely observe and handle crystals and rocks. Soon they will have screens with explanatory touch technology, an info-graphic-edge, and scientifically irrefutable. They intend to set up in the garden of the old school surrounded by botanical flowers and native plants. The beautiful collection was donated mostly by two collector-researchers who are real international authorities about this type of minerals, they have dug for years around the museum and if Joseph can manage to find funding for new display cases they are ready for other donations! In honour of the little village that houses it, the museum is named after a well-known character of San Piero, Luigi Celleri. This character would be good to write about on a post. He isn’t one of many academics and scholars who frequent the areas of Mount Capanne and who would give an prestigious aura to the museum, but instead a very special local man who was born and who died in San Piero during the second half of the eighteenth century specialized in research and minerals, who has dug up some exceptional pieces, financed by important collectors, especially by Raphael Foresi, Elba of origin and Florentine by adoption. But the thing that most of all touches my heart, is that the museum of San Piero and one in Rio Marina, are run by passionate people who work collaboratively and amicably together, something even rarer than the most precious, perfect and beautiful Elban tourmalines.